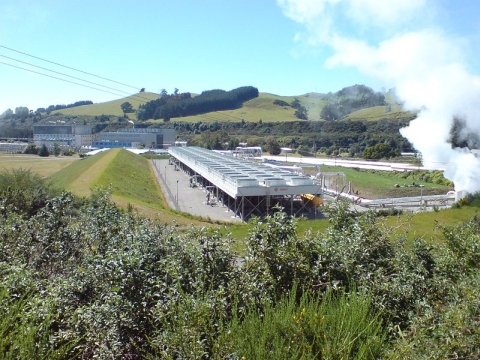 Wairakei is a power station, small settlement and a geothermal area a few kilometres north of Taupo, in the centre of the North Island of New Zealand, on the Waikato River. 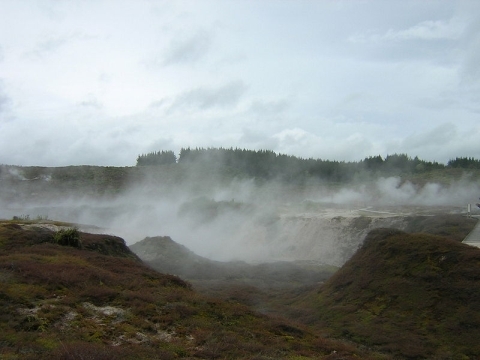 With several natural geysers, hot pools and boiling mud pools, it is also the home of the Wairakei Power Station, a major geothermal electric power generating station. The station was the second large-scale geothermal facility worldwide, and was commissioned in 1958. It was listed in the book 70 Wonders Of The Modern World published in 2000 by Reader's Digest to record The Eventful 20th Century. The settlement, referred to as Wairakei Village, was constructed to house the workers of both the power station and the neighbouring Aratiatia hydro power station. rear. The binary plant is in front.